Hotham History visits Jack’s Magazine. In March, Hotham History Project members found their way to this remarkable 19th-century edifice that nestles inside impressive bluestone walls on the banks of the Maribyrnong River. What is Jack's Magazine? It is the largest magazine complex ever built in Victoria and opened in 1878 to provide safe storage for gunpowder imported into the colony of Victoria. It was used up until the 1990s, mainly as storage for the nearby ammunition and ordinance factories that employed thousands of men and women at the height of World War II. Sitting empty for quite some time and with a new housing estate hedging it at the top of the escarpment, this historic survivor is now man-aged by a self-funded and not-for-profit group, Working Heritage, who look after diverse his-tonic places and find new uses for them. Our guide for this tour was Andy Calvert, a personable, knowledgeable man who began his working life as an apprentice at the am-munition factory, which used to be adjacent to Jack's Magazine and has had an ongoing association with the site since that time. Jack's Magazine consists of several buildings, such as the small arms ammunition store and the examining room, but the two identical gunpowder magazines are the most remarkable. Like the 900-metre-long perimeter walls, they are built of bluestone blocks. The raw basalt was dug out of the escarpment and fashioned and then the massive buildings were built into the two furrows excavated. Everything was designed to manage an explosion, from the placing of these buildings deep-set into furrows with earth ramparts be-tween and surrounding them, to the insides, where there were double-slotted vents (just in case a stray bullet should be fired towards an opening), strong bluestone walls and a light-weight roof. In the event of an explosion the blast would go upward rather than outward, which would have caused a greater catastrophe. Barges brought the gunpowder barrels to the site from Port Phillip Bay, along the Maribyrnong River and up the canal connecting the river to the loading dock. After being hauled up to the loading dock, the barrels were pushed on trolleys around the site's tramway. The trolleys were pushed by human power, not horses, as it was considered that men could jump out of the way if a trolley overturned but harnessed horses might bolt and create a much bigger hazard. 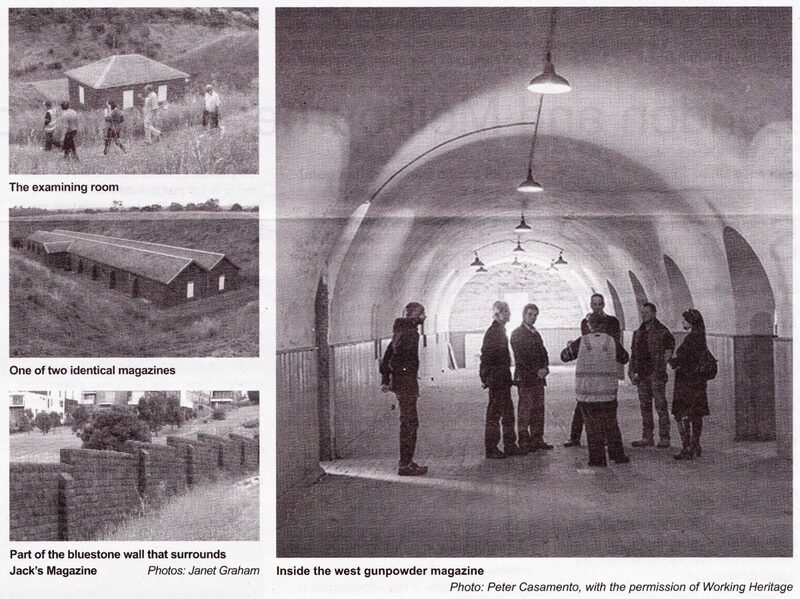 The interiors of these gunpowder storage buildings were again designed to prevent explosions, the barrels of gunpowder being stored along the sides of the interconnecting vaults with their concave ceilings. The timber floors were made from both softwood and hardwood, the latter being used in the centre. The wainscoting — that is, the panels lining the lower part of the walls was also of softwood, which better absorbed knocks by the barrels. Now long empty, the magazines evoke awe and a haunting beauty both inside and out. Oh, and why is it called Jack's Magazine? This place has had many names: Saltwater River Powder Magazine, Footscray Powder Mag-azine and the Maribyrnong Magazines. A man named Wally Jack was foreman there from World War I until 1943. It is said that he had a fearsome reputation and ruled it like his own kingdom. It became known as Jack's Magazine and the name has stuck until this day. Tours of Jack's Magazine are conducted regularly. Contact Clare Chandler, the project officer at Working Heritage, by emailing c.chan-dlergworkingheritage.com.au.